Aircrafts: 595, 597, 598, 05. Every type of military Russian aircraft should pass the State Acceptance Trials. First stage (A) to confirm flying characteristics, in a state (Ministry of Air Industry) institute LII @ Zhukovskiy. Stage B - military - to confirm combat characteristics, in a 929 Gosudarstvyenniy Lyotno-Ispitatyelniy Cyentr (GLIC) in Akhtubinsk = State Flight Research Center (Defence Ministry of Russian Federation). LII is a research and development establishment, which handles the most relevant problems of aviation and cosmonautics with the methods of scientific experiment using flying laboratories, models, test and production planes. It's tasks is: testing prototype aircrafts and equipment, conducts most complex prototype tests, improving the techniques of prototype flight tests, improves the standard testing techniques to use in military and civil aviation and issues corresponding guiding documents (prototype testing manuals, adequacy-testing methods, etc. ), developing the safety issues. To perform a tests of Su-30, LII get in 1992 some aircrafts: one single-seater Su-27P number 595 (ordinary Su-27 no. 320, serial number 37-11) without air refueling produced in single copy for Kvochur's team order and two double-seaters Su-27PU numbers 596 and 597 (bought for LII by insurance society Jupiter, now - 2008 - Jupiterus). Under command of test-pilot Anatoly Kvochur an aerobatic team was created, named Test Pilots Team (active 1992-1996). These aircraft have no military installations and underwings hardpoints were removed. They have a special painting (called parrot) in white, red and dark blue. LII: Su-27P, 1993, Test Pilots display team. Two Su-27PU (596 and 597) it's a first and second serial heavy interceptor figher Su-30, produced in Irkutsk in 1992-1993. In total eight aircraft were built: two for LII, 5 for Russian Air Force (54th IAP @ Savaslyeyka, numbers 50, 51, 52, 53, 54). One left in IAPO facilites (number 56) and later will be converted to Su-30MKI prototype with canard foreplanes. LII: Su-27PU, 1994, Test Pilots display team. LII: Su-27PU, about 1996, Test Pilots display team. When in 1993 1st prototype of multirole Su-30M was built (for Russian air force), aircraft Su-27PU number 596 was converted to prototype called for export Su-30MK, with new painting and renumbered to 603. Aircraft was presented in many air shows, for the first time in Chile (FIDAE 1994). To replace 596, Test Pilots team gets in 1994 aircraft Su-27PD number 598 (serial number 37-20). During the years 90s, all three aircraft of Test Pilots team were presented on air shows, often demonstrating air refueling. 1st prototype of Sukhoi Su-30MK (ex. Su-27PU no. 596), 1994. LII: Su-27PD, about 1996, Test Pilots display team. In 1999 aircraft piloted by Kvochur fly over North Pole in research flight for test satellite navigation systems in Arctic, with Tu-95MS and Il-78. In 2000 aircrafts Su-27PD no. 595 and Su-27PU no. 597 were selected to deep upgrade demonstration-experimental projects. They are repainted in 2001 with new grey-blue scheme and gets numbers 595 and 02. Full military equipment was mounted, including OLS. Aircraft 595 is fitted out (01.2000) with developed by MMPP (Moskovskoye Mashinostoityelnoye Pryedpriyatye) Salut modified engines AL-31FM1 with experimental TVC nozzles (with Klivt = Klimov vectored thrus, totally different from TVC-engines AL-31FP from Su-30MKI) and used to flight tests and refining of the modified engines. Aircraft no. 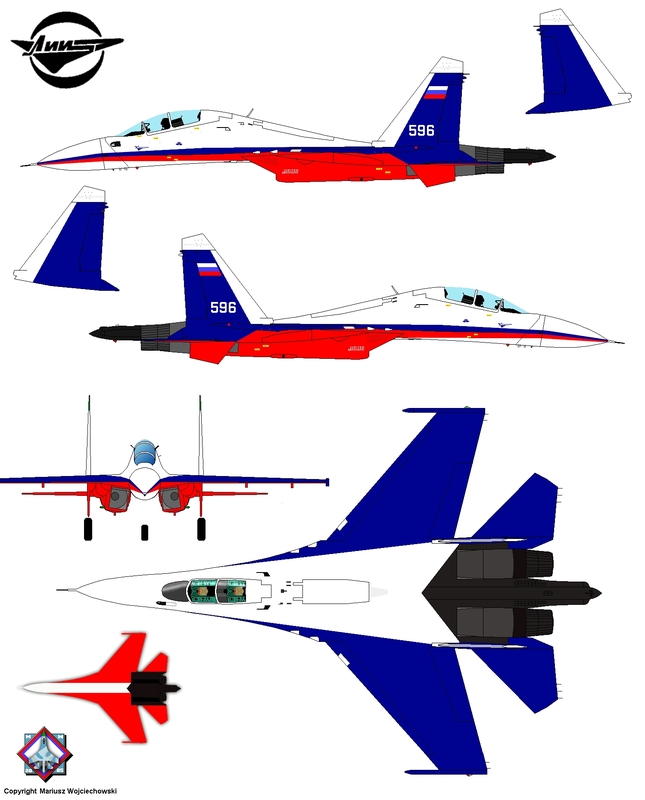 02 become in 2000/2001 a second prototype of upgrade program Su-30KN (after well know prototype no. 302) and was presented to high command of Russian Air Force in 03.2001 at Zhukovskiy (also So-30KN no. 302 and Su-27UBM no. 20). After failure of KN upgrade program, even commercial flight was offered on no. 02, by "Space Flight" (2005)! March 2006 Analoty Kvochur, probably most known Russian pilot after Victor Pugachov, demonstrated in China his excellent skills, flying about 2-3 meters above ground! In that time, number 02 was removed and original 597 restored. In the middle of the year 2006 both 595 and 596 were repainted in original colours (but dark blue is now a little lighter). Note that 598 have that painting for all time, since 1992 (even when in 2000-2001 aircraft was used as testbed in upgrade program of Su-27S/P to Su-27SM standard). Lyotno-Isslyedovatyelskiy Cyentr (LIS; later Pilotazhno-Isslyedovatyelskiy Cyentr PIS) = Research Pilot Center (until 1996 – pilot group "Test Pilots") was founded by Anatoliy Nikolaevich Kvochur in 1992 at LII to carry out the research programs on designing of cabins and control units over the maneuvering aircrafts, satellite radio navigation, over extra refueling in the air, extra long-distance non-stop flights, extramanoeuvrability operations, for the medical purposes, as well as for the purpose of performance of demonstrative flights of the planes Su-27, Su-30 and MiG- 29 to be done individually or in a group. Sukhoi Su-S7UB, Lyotno-Isslyedovatyelskiy Cyentr (LIS)= Research Pilot Center of the Sukhoi Design Bureau near LII @ Zhukovsky, 1995. September 8th, 2006 to commemorate of the 70-th anniversary of the non-stop flight by the Hero of the Soviet Union, Valery Chkalov, made in July 1936, Anatoliy Kvochur has repeated the Chkalov’s itinerary on board os Su-27LL no. 597 - from Zhukovskiy to Czkalov Island on Far East and back. The airplane (Kvochur and Serguey Viktorovich Korostiev) will cover more than 12.500 km. It will take around 14 hours 30 minutes. During the flight, Anatoliy Kvochur will have 4 fuelings from 2 tankers IL-78. That day the "Exposition of MVK achievements in the stratosphere" was presented on board the refueling tanker Il-78. Event was organised by MVK Exposition Holding, the leading Russian exposition company. Of course, flight was recorded in Guiness Record Book. 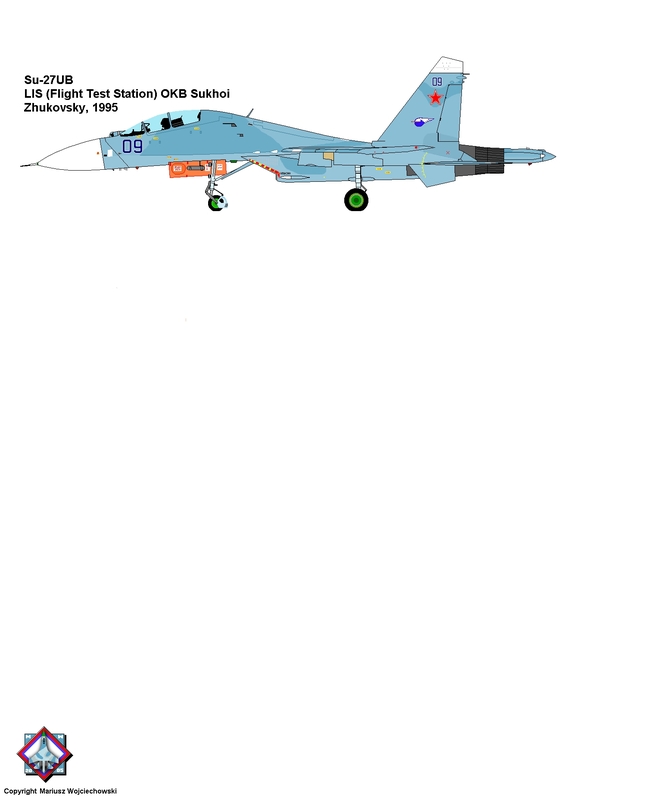 LII: experimental Su-27LL (ex. Su-27PU, ex. 2nd prototype of Su-30KN), 2005. LII: experimental Su-27LL (ex. Su-27PU), 03.2006; engines developed by Salut. LII: experimental Su-27LL (ex. Su-27PU), middle of 2006, Tambov air base; restored colours and military equipment. In 2001 LII obtain new aircraft, one of the old testbed used by LII and Sukhoi Design Bureau. 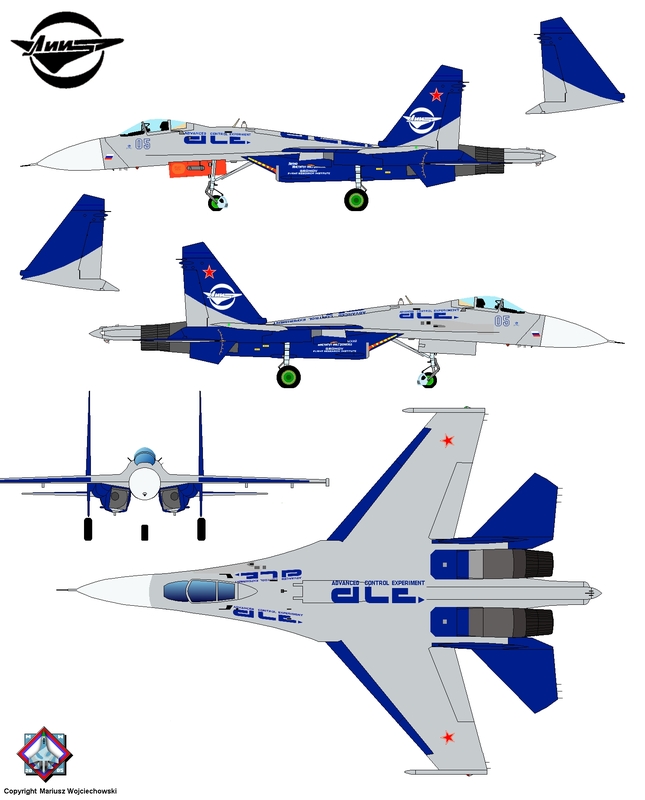 It was Su-27LL number 05 (serial number 24-05), which get new grey-blue painting, especially designed for LII's aircrafts. The plane was previously used in 1991 in T10M project as experimental aircraft with rightside control joystick into cockpit. In 2001 was equipped with totally new electronic control system and presented during MAKS-2001 in Moscov, as Su-27LL ACE for Advanced Control Experiment. In MAKS-2003 has engines with TVC nozzles. Probably still in LII inventory and retain grey-blue painting. 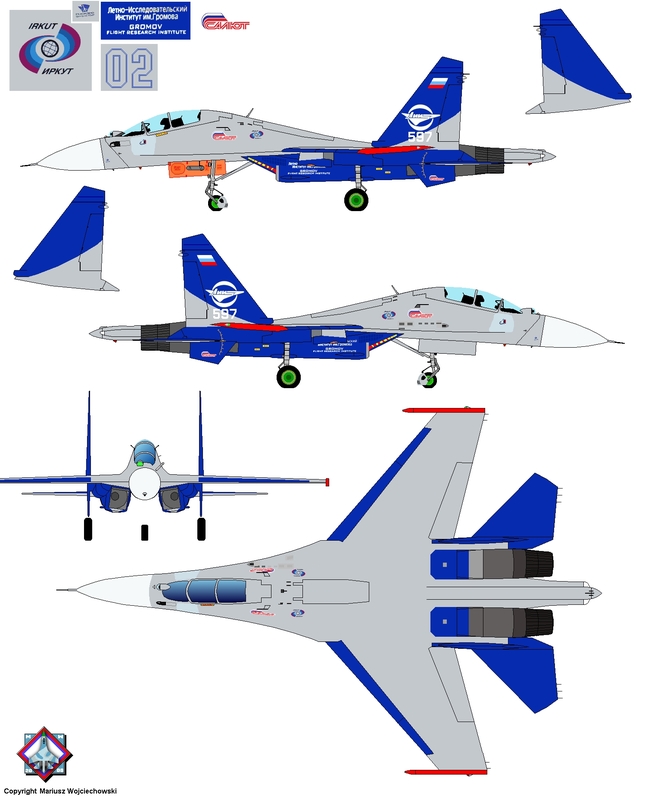 LII: experimental Su-27LL ACE, 2001.